Welcome. Welcome. Welcome. Firstly welcome back to students returning from holidays. I hope that you have had a chance to recharge your batteries and get stuck into another year of study here at UON. Welcome also to those students who are starting study here at UON for the first time. You have so many new experiences to look forward to! Welcome also to those students who are returning to UON after a large break in study. There will be many changes for you to experiences, some which will be met with excitement and relief (increased coffee stations across the campus) and others with hesitation (the technology has exploded and the options are far greater). Regardless of what brings you to UON this year take some time in the first week or so to really take in your environment. Find a place on campus you can relax in now so that when things start to speed up you will have somewhere to go and find your inner calm. Stock up on mosquito repellant and look for the best places to nab a park in the early weeks and remind yourself that the fight for a park becomes easier after week 5 or so. Make time to visit all the services you might need on campus early, like the student HUBS, library, printer, pharmacy, health service and counselling so that later in the year if you need some additional help you will know where to find them all. Finally take the time right now to breath and enjoy the smell of fresh text books, new pencil cases and stationary supplies and open your mind and heart to the new opportunities and people you will meet in 2017 here at UON. We focus on new beginnings every January, making resolutions, saying things will be different this year and leaving behind the past year. Truth is that most resolutions made are broken and some of the previous year/s will travel forward with us. This doesn’t always have to be a bad thing after all its the challenges that we face that help mold us for the future ones. And let’s face it some of our resolutions can be a little unrealistic – like the preservative, additive and refined sugar free diet I put my whole family on starting school return! There are some things though that we try and move on from, forget and block from our minds. We might be successful in doing so for a while but when we get over loaded, are in a new experience or we experience an unexpected trigger in the environment the memories return despite our efforts to bury them. Sometimes these past experiences might be the loss of someone we loved, abuse we have suffered at someone else’s hand or trauma from an accident. Regardless of what the situation when the memories creep back our distress levels increase, it’s harder to concentrate and keep going, panic can set in and for some they walk away from something they love to escape the pain. Or they stay but don’t quite achieve what they were hoping for, making another compromise for something they had no fault in. When you have tried hard to bury the memories it seems natural to keep trying to bury them rather than share the burden with someone and ask for help. Or maybe you tried getting help in the past and felt no one was listening or that it didn’t work for you. Maybe the type of help you sought and received wasn’t the type of help you needed at that time. Timing can be everything. So can finding the right person to ask for the help. Maybe your situation has changed now, or maybe you feel like you have tried to be strong and push on for long enough. Or maybe now is the first time you have been offered help? Individual counselling is only one option to consider, and let me tell you, here at UON there are a few options to consider. For example you can see one of the GP’s on campus and get a referral to a private Psychologist on campus who Bulk Bills via Medicare. Or you can come and speak to one of the counsellors on campus without referral. If doing it all face-to-face seems a little daunting then you can speak to one of the online counsellors either at the drop-in skype sessions or by making an appointment. If individual counselling isn’t for you then maybe there is a support group in the area that offers support, like the Survivors and Mates Support Network who offer an 8 week support program for adult male survivors of childhoods sexual assault, or maybe SIDS and KIDS 24 hour telephone support line. I might not have mentioned a support specifically for each person reading this who identifies with it. Have a look around this blog and see if you can find the resources you are after or contact us and we can try and locate something for you. If now isn’t quite the time then but a bookmark here in case the time comes later or sign up to our blog so that you get a weekly e-mail with our posts. At the very least check out the tip sheets we have on Balance and Healthy Wellbeing, grounding techniques, or some of the others to help you keep things going this year! Well, it’s day 1 of my febfast challenge – no chocolate icing for me! I am doing great so far, however I am aware that I am at work and my icing ingestion usually occurs at home. So, I thought it would be a good idea to have some strategies ready to manage any icing cravings that do arrive after dinner tonight. 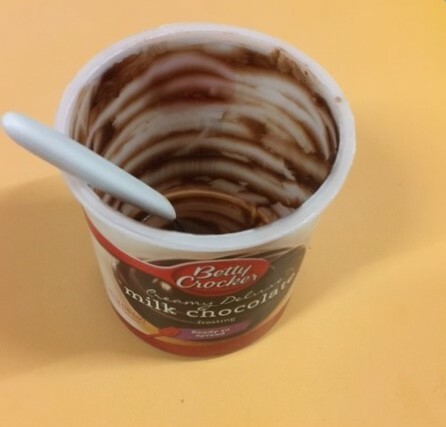 Remove or avoid temptation – I ate the last of the temptation in my house yesterday! These strategies can be used for any type of craving. If you have any other other useful strategies, please let us know! Don’t forget you can support me, and a worthy cause by donating here.